Super document previewer lets you view files inside the embedded Media Player. The document previewer can view all kinds of images, audio, video, Office Word, Excel, PowerPoint, PDF etc. And it can view VMC media library directly. The document will automatically record the file names you viewed and save to the corresponding category. You can click the Category button and select the sub category to view the files just viewed again. You may check the Pause Preview button to temporary pause preview. 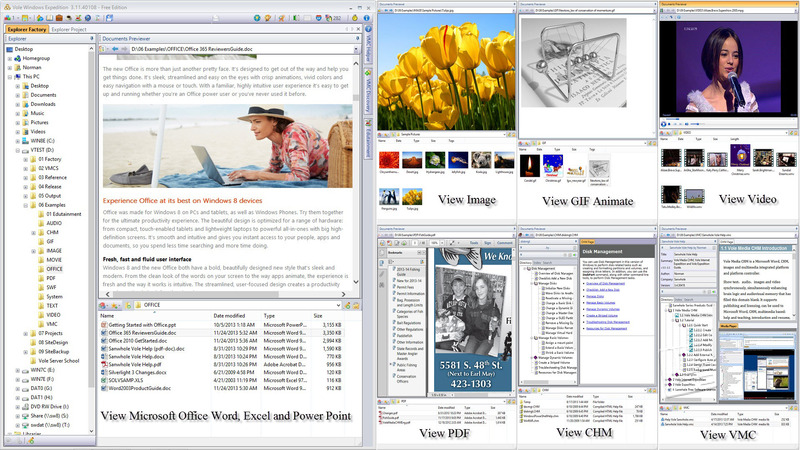 In this screenshot, the left image is a full screenshot previewing a Microsoft Office Word doc (Need Microsoft Word Installed) and the right 6 images is the partial document previewer screenshot for image, GIF animation, video, PDF, CHM document and VMC media library.